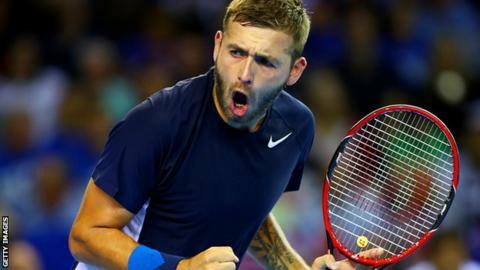 Dan Evans could play for Great Britain for the first time since serving a 12-month ban for cocaine use in Friday’s Davis Cup tie against Uzbekistan. The 28-year-old has mainly played on the second-tier Challenger Tour since making his comeback in April. Cameron Norrie and Jay Clarke are also in the team, with doubles specialists Jamie Murray and Dominic Inglot. Three-time Grand Slam champion Andy Murray will miss the match to continue his gradual return from hip surgery. British number one and world number 16 Kyle Edmund is also absent as he recovers from a recurrence of tonsillitis. Evans’ last appearance in the Davis Cup was April 2017’s quarter-final defeat by France. During Britain’s run to the trophy in 2015, he played in the semi-final win over Australia. This season Evans has climbed back to 222nd in the world, winning a Challenger event in Vancouver in August en route. He lost in the second round of Wimbledon qualifying after he was not granted a wildcard into the main draw. Evans was ranked at a career-high 41st in the world when he failed a drugs test at an ATP event in Barcelona in April 2017. He was banned for a year after, claiming that remnants of the recreational drug contaminated legal medication in his washbag. “It’s a shocking drug, and it’s not just in sport – it’s terrible in life. It’s a life-ruiner,” said Evans in April. Uzbekistan have called up world number 60 Denis Istomin for their first meeting with Great Britain, however Jurabek Karimov – their next highest ranked player – is only 434th in the world. After defeat by Spain in the first round of the World Group in February, the meeting was set to be a relegation play-off with Britain’s five-year stay in the competition’s top tier at stake. However, the Davis Cup will change to an 18-team event season finale in 2019, rendering the match effectively meaningless. The shift to a format more like football’s World Cup is part of plans backed by Barcelona defender Gerard Pique and voted in by a majority of International Tennis Federation members in August.